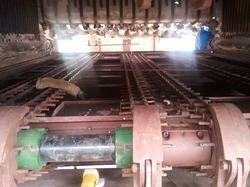 Deign, Manufacturing, Supply & Exporter of Verius Type Boiler Furnace Grates. Broadly acknowledged for its quality, our organization is engaged in offering a vast range of Traveling Grate Boiler. The offered grate boiler is manufactured with precision by utilizing top quality factor inputs that are obtained from reliable sources of the markets. According to the industry norms, our grate boiler is demanded across the nation due to its quality. The offered array of grate boiler is accessible in different specifications according to the customer’s requirements. This grate boiler is availed from us at reasonable rates. As an acclaimed enterprise of the industry, we are offering a broad range of Moving Grate Boiler. These Moving Grate Boiler are acknowledged for their high quality and durability, among our customers across the nation. The offered Moving Grate Boiler can be customized, as per requests of our customers, nationwide. Our Moving Grate Boilers are meticulously monitored at the time of manufacturing in order to fulfill quality norms.